The rest of the team (I guess I should call them my teammates), just calls me Kicker. Well, they don't really call me, but, I'm The Kicker. Due to my awesomeness, and my safety, I'd prefer to stay anonymous for a while. But, I'm willing to share my story with you all. Once a week. I've been kicking the ball for 5 long months. I even had to go through track and field stuff! I kept wondering if they knew I was the kicker?! Why should I run around and do all these drills that made no sense to me. I'm there to kick the damn ball and hopefully score. However, all those drills made me feel like I'm a part of the team. Sometimes, kicking the ball gets lonely. Kickers are humans too, you know. I remember I was counting down the days until... GAMEDAY! 5 long months! Well, 153 days to be more exact. Or 3672 hours. I spent 1224 hours sleeping though, so that shouldn't count, I guess. When we take out hours I needed for class, studying, work, practice and getting sober - turns out that I maybe had 2 minutes per day to mark my special calendar. Kickers calendar. I had everything planned out! 2 weeks before the game I'd start meditating and doing some basic yoga. Oh, this is not the place to share my private moments. Back to the real men's game! Let's start all over. I had everything planned out! 1 week before the game I invited everyone I know (and their momma) to come see me at the game. I almost had a tooth knocked out BUT I got my jersey number. 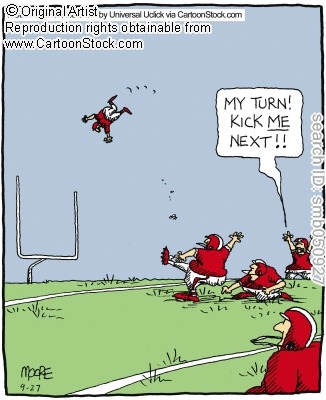 Imagine this - "Kicker # scores the winning FG!". I know it will take some time for the rest of the team to realize how cool I am, but I got my jersey number! - Everyone gets a jersey number? Even the punter? Oh. I even had wallpapers ready. Some were promoting the game while I was posting my wallpapers. - Get 'em while they're hot! Man, I came to the stadium before everyone. 3 hours before kickoff. My first time on the field as an american football kicker. Grass couldn't feel more soft than that morning. As soon as the game started, after my teammates scored a TD, I knew it's my time to shine. I felt like I was on top of the world. All eyes on me. Everyone is silent, waiting for me to kick it and score that extra point. Bad snap. I never got to kick the ball for that 1st TD of the season. However I did score - there were 4 more TDs. Thanks offense! Whole team was so nice to me. Even before the game. I felt like a part of the team for that one week. It was an irreplaceable feeling. Everyone said such kind words, although I still think coach made them. Everyone kept telling me that I'm the man. I knew I was a man, so I wasn't sure why they were saying that. I know now. Every kick is a brand new story. 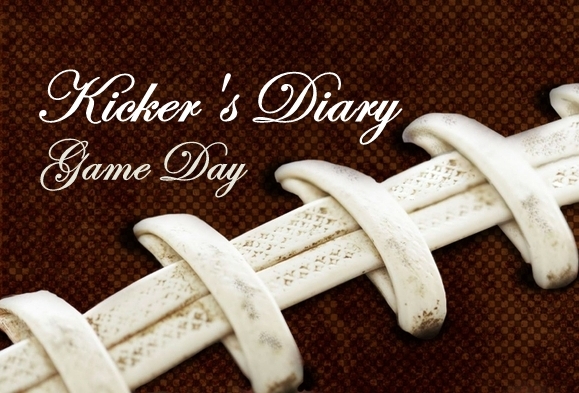 And every kick makes me a better kicker. Even if I miss.